Okay, just to clear up the argument once and for all, these Ghostbusters did come first… sort of. In 1975, Filmation aired a half hour live-action program on Saturday mornings called The Ghost Busters. 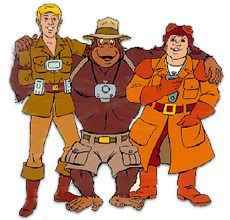 The show featured detectives Eddie Spenser and Jake Kong and their ape partner Tracy busting famous spirits from the past. The sitcom was cancelled after one year and left for dead. But, as we all know, there was a little movie from Columbia Pictures in 1984 that made a ton of money, and ghost busting was suddenly hip. Filmation seized the opportunity to resuscitate its own property as an animated series, Ghostbusters (one word, like the movie.) After a brief legal tangle, both this show and Columbia’s The Real Ghostbusters went on the air in 1986. The only thing both shows had in common was the idea of catching loose spirits. Filmation’s show teamed Tracy the ape with Spenser and Kong’s two grown sons (also named Eddie and Jake), again chasing the ghosts of history and myth. New associates included sassy TV reporter Jessica, sorceress Futura, Belfry the Bat, and a house full of wisecracking skull and bones gadgets (phone, TV, etc.) In fact, much of the Ghostbusters’ accessories had lives of their own, from Ghost Buggy to the shape-changing logo. A red-caped villain named Prime Evil, who actually looked more robotic than ghostly, was the comically menacing bad guy. At the end of every program, Belfry and the skull TV explained the moral of the day’s story, a custom of many cartoons of the time. The duelling Ghostbusters peacefully coexisted for two years before this series was cancelled.